Multi-spectral imaging of carotid arterial plaques using T1-, T2- and PD-weighted black-blood imaging pulse sequences has been introduced for the characterization of atherosclerotic plaques. However, the detection of the clinically relevant lipid-rich necrotic core (LRNC) in humans remains highly elusive. 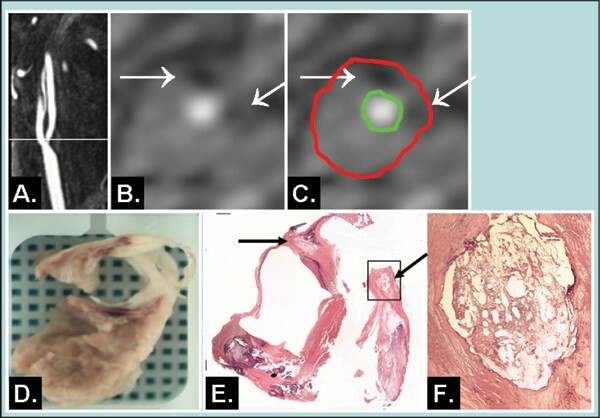 To develop a novel, gradient-echo-based, bright-blood imaging pulse sequence for the visualization of the LRNC in human carotid atherosclerotic plaques and to validate it against histopathological specimens. We hypothesized that a gradient-echo-based 2D FLASH imaging pulse sequence with fat suppression can identify the LRNC as regions of decreased signal intensity, compared to the non-lipid rich areas in human carotid atherosclerotic plaques. Five patients scheduled for carotid endarterectomy were imaged on a 1.5 T clinical scanner using a commercial neck matrix coil. A cardiac-gated, segmented, 2D Fast Low Angle SHot (FLASH) sequence was performed with a fat suppression pulse in an axial slice in the region of the plaque with the largest area (Figure: Panel A, B and C). Imaging parameters were as follows: TR 142–150 ms, TE 6.2 ms, flip angle 90°, FoV 179 mm, matrix 256 × 256, slice thickness 4 mm, 4 signal averages. Delay-time was optimized for image acquisition in mid-diastole. Based on preliminary data, we identified areas of low signal intensity, corresponding to the LRNC (Figure: white arrows in Panel B and C; black arrows in Panel E). Histological specimens were registered to the imaged slice using anatomical landmarks; hematoxylin-eosin staining was performed to identify the acellular LRNC. Image post-processing was performed on a dedicated workstation. To correct for variability in signal intensity between patients and scans, the original DICOM images were normalized to air on a pixel-by-pixel basis in each patient using commercial software (Image J; Bethesda, MD). Signal intensity measurements were performed on the normalized images within regions of the LRNC and were compared to remote areas. Remote areas were defined as those regions within the plaque that excluded the LRNC and the blood pool. Values are expressed as mean ± SD and were compared by a two-tailed t-test; p < 0.05 was considered statistically significant. Four of the five patients had LRNC indicated by specific areas of low signal intensity on the FLASH sequence; the same four patients had LRNC in the same regions by histopathology. Signal intensity within regions of the LRNC was significantly lower compared to signal intensity in remote areas (5.77 ± 1.35 vs. 8.03 ± 0.75; p = 0.006). These regions corresponded to areas of the LRNC in the histopathological specimens (Figure 1: white arrows in Panel B and C; black arrows in Panel E; inset in Panel E; Panel F). Our novel, gradient-echo based, bright-blood FLASH imaging pulse sequence is highly accurate for the identification of the LRNC in human carotid atherosclerotic plaques. Areas of low signal intensity correspond to areas of the LRNC on histopathology and signal intensity in these areas is significantly lower than in other regions within the plaque.